Chinese Pistache " Pistacia chinensis This tree has gained a lot of popularity over the past several years and for good reason. 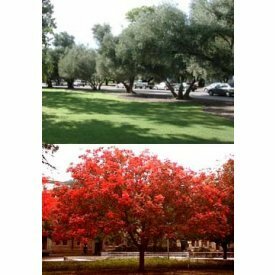 It tolerates drought and diverse soil conditions and is one of the most colorful trees in autumn. The color change is slow and therefore provides beautiful hues for a lengthy period. In time, it provides decent shade. It is most effective as an ornamental, however, and works well near patios or decks. Please note that these items will be shipping in dormat condition some may arrive with no leaves. Depending on the method of shipping you select your item will arrive within 1-10 days,. An early snow or frost will not harm a nursery stock item that is already dormant. On the other hand, these items can also be planted during warm weather--simply be sure to water well. Potted perennials can be planted outside anytime after your last frost until your ground has frozen solid for the winter.